Ballumbie Castle Golf Course is a parkland course based on the outskirts of Dundee. Its terrain sweeps and turns with no two holes the same. Most clubs in the bag will be used but not necessarily a driver off every tee, especially for the first six holes of the course where position is more important than distance. We have an ever growing members list and are looking for you to Join us. Ballumbie is great for all ages. There is a lot of competition across the board Seniors, Mens, Ladies and Junior all through the season. With a large junior section this includes a lot of competition along with weekly group coaching from our club Pro. *Students must provide evidence of full time education and proof of ID. Competitions 5 days a week throughout summer months. Guests can be play alongside you for just £10 throughout the year. No winter mats & full greens all year. 20 bay driving range with reduced rates for members. Full catering facility with members & private functions. Free junior coaching and junior competitions for members. You can download the membership form by clicking here. At Ballumbie we look to treat visitors as temporary members and offer the use of all Ballumbie facilities on their visit. Come into the club house and grab a bacon roll and coffee before your round or hit the driving range to loosen up. After your round, there are showers and lockers available to get freshened up. You can enjoy a meal in the restaurant or a drink at the bar after. You might be in luck and be treated to one of our live band nights. We also have package deals available for individuals and groups. *Birdie deal consists of coffee, bacon roll, then 18 holes of golf followed by a two course meal. 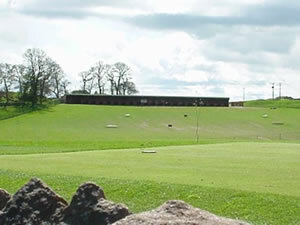 Ballumbie Castle Golf Club also has a 20 bay covered driving range that can be used by members and visitors to improve their game. The range is fully floodlit so is ideal for practising during the day and after dark. There are targets to hit at 40, 55, 85, 150, 200 & 250 yards so you can work on all aspects of your game, from your pitching to your driving. Ballumbie Castle Golf Club held their annual Men's Open Day on the 15th July 2017. As well as overall winners, we also run longest drives and cloest to the pin competitions. The winners list with the prize money can be seen below. In addition to the winners listed below, there were also thirty-two 2s recorded. The Competition Scratch Score for Ballumbie members was 70. The Competition Scratch Score for non-Ballumbie members was 73.